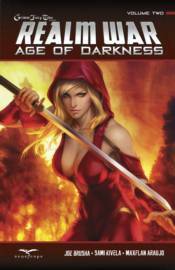 Following the epic and shocking events of Grimm Fairy Tales #100, the Age of Darkness has descended upon the Grimm Universe! The Dark Queen successfully merged Earth with the surrounding realms of Wonderland, Neverland, Oz, and Myst. She now rules over a frighteningly apocalyptic new world. After dealing a crippling blow to the Realm Knights, the Dark Queen seems assured of her power. Despite such a defeat, Sela resolves to end the Dark Queen's brutal reign. She and what's left of her team seek out a weapon powerful enough to give them the advantage they need. But is it too little too late? This Zenescope trade paperback collects issues 7 through 12 of Zenescope Entertainment's twelve issue Grimm Fairy Tales: Realm War series.